I've always loved tarepanda, the cute lazy panda. 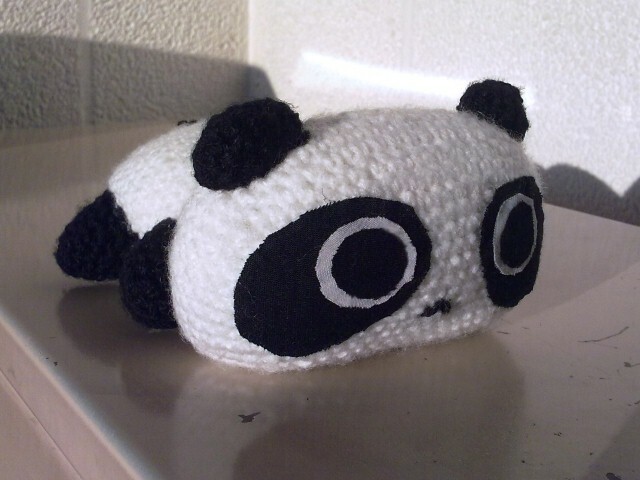 Lately, I've started making amigurumi (crochet dolls) and I really wanted to make a tarepanda one. I found the Japanese pattern here. 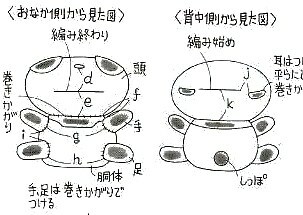 At first, the Japanese pattern had me puzzled because I'm a noob at handwork and I had never seen any kind of pattern before, let alone in Japanese. But after reading this guide, it all makes sense to me. There seem to be some people that want this pattern written out in English though, so I'll do my best to write it out. If you see any mistakes or have suggestions, let me know so I can improve it. You'll need white and black wool for this. Everything that should be black is highlighted in black, the rest is white. In the Japanese pattern, every round was joined with a slip stitch, but I didn't do that because it didn't seem necessary. You only really have to use slip stitch to join in the two round before you switch between colors in the body or it will look odd, so I wrote that in my pattern. The extra black in 18) and 19) should be in the middle of the tummy. 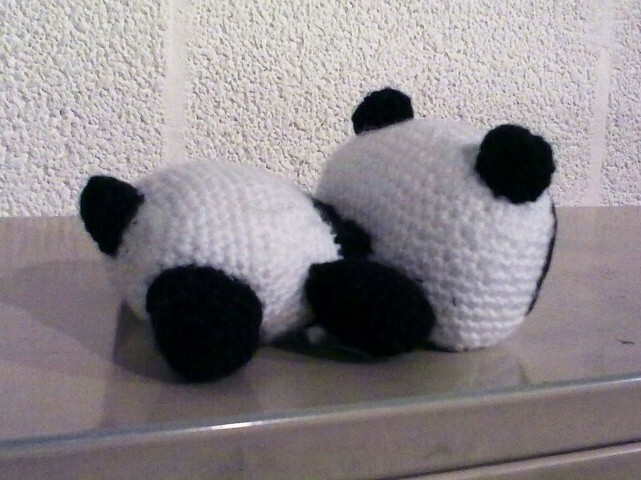 When I made my panda, this didn't work out, so you might have to adjust the pattern a little so it's in the middle. Attach the head to the body; the slit where you closed the head should be on the bottom. Then you can attach the arms, legs, ears and tail. Finally, you can make the eyes out of black and white felt and glue them on. Look at the following images for reference. You can print this on an A4 paper to get the shape of the eyes right. Thank you SO much for this pattern in English! One question though... why did you write "10x Sc"? This is the first time I've ever seen that written in a pattern. I just want to know what it means. Heh, sorry I've never written a pattern before, so I wasn't sure how to write it, it just means single crochet for 10 stitches. I will add a explanation of the terms that I used. Thank you!!! I've been meaning to try the pattern out but it always looked so complicated. Now I can finally crochet tarepanda! Thanks for translating the pattern! I had a quick question about Dc-triple. I looked it up and couldn't find a straight answer. I found triple crochet and double triple crochet, so I wasn't too sure. Thanks! I just made up the term "Dc-triple", because I didn't know what to call it. It's like a double crochet increase, but instead of putting two double crochets in the same stitch, you put three double crochets in the same stitch. I actually find your way of writing out patterns so much easier to understand. 2) Sc-increase, 10x Sc, [Sc-increase, 3x Sc-increase], 10x Sc, 2x Sc-increase = 32"
The third Sc-increase shouldn't be there I think. I counted the amount of stitches. I thought it was weird that it was Sc-increase, 3x Sc-increase instead of just 4x Sc-increase so I double checked. Also, you mistyped "increase" in some places but it's not that important. So excited to finish my Tarepanda! It's my first crochet project and it looks awesome. Thank you so much! I'm glad that my post helped you. Thanks for telling me about the typo, I'll correct it. It was a lot of typing to do, so I'm bound to have made some mistakes. Thanks for your comment. I used a size 3.5 hook, but you can use whatever size you want, it'll just make the panda smaller or bigger. 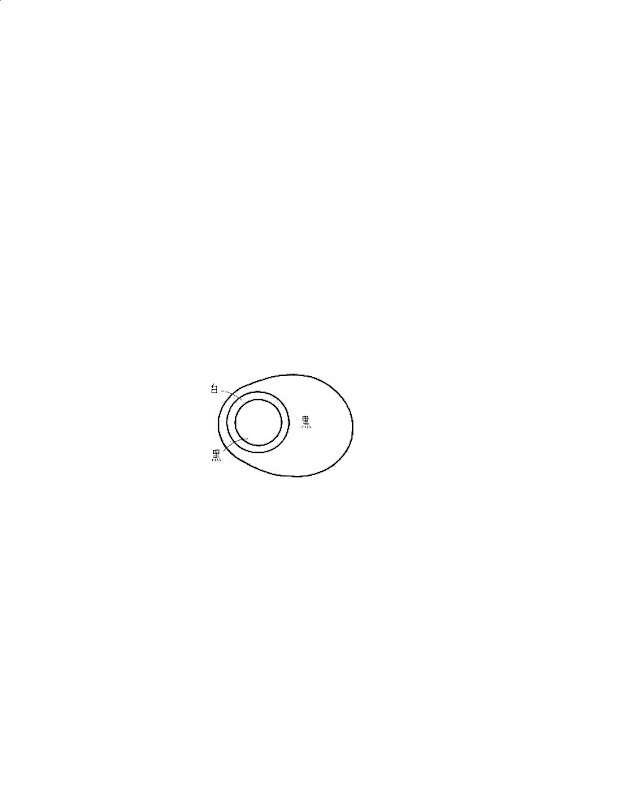 1) 30x Sc (14 on each side of the chain and 1 extra at both ends) = 30 -- Could you do a video or something? Thank you SOOO much for taking the time to translate this pattern! It looks wonderful, and I'm so excited to try it out :) I was wondering, how much yarn did you need to make the panda?? Oh thank you for translating the pattern. I want this to be my third crochet project. So far I've managed an elephant and in progress on cow. Tarepanda would be an excellent addition. but I'm a beginner so there's something i really don't understand. when starting color black at row 18 in the body, what does this have to do with slip stitch? ?, where should i put the slip stitch exactly? i stopped at the last Sc before the black 6x Sc at row 18 and don't know what to do. The black part on row 18&19 is the black spot that is a bit bigger on the tummy (you can see it on the drawing). You don't have to do this if you don't like that, or if it's too complicated. At the end of row 18&19, you would use a slip stitch (only the last stitch of the row) to reduce the height difference. I did this so it would look nicer when I switch the color to black in row 20, otherwise it looks a bit odd. Did you start the head also with a circle? Sorry for the late reply. No, I started the head by chaining 14 stitches. The body is started with a chain as well. The limbs and all other small parts were started with a magic circle. The last two decreases, I actually got to 30 stitches with just one. Now, is it my mistake or maybe you got confused while writing the pattern? Since I'm pretty much finished it's not really a problem, I was just wondering! I am translating to Spanish too. If somebody want it just ask. Thank you so much! I was looking for this for too long now! Hooray! I can't wait to make it now. Thank you for doing the interpretation and posting! Thanks so much for this pattern, I have been looking and looking and looking now I can make it. yaha!!!!!!!!!!!! I'm very confused about row 3 for the body because every time I do it. It shrinks. ooooooohhhhhhhh i love it!!!! thanks!